One of my five housemates is an intern for the geology department at Mount Rainier. 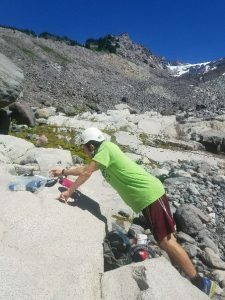 As part of the imminent threats team, Ian collects water samples from glaciers around the park to build comparative data for the prediction of glacial outburst floods. Ian navigating the safest route to minimize risk to hazards such as rockfalls. 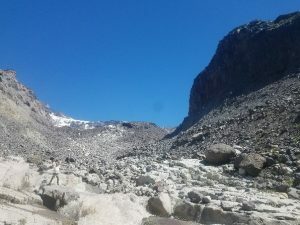 Glacial outburst floods occur when water accumulates behind the thinning walls of a glacier. The walls eventually break and release the water. 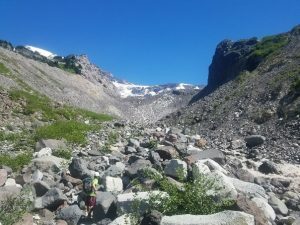 Glacial outburst floods are of concern within the park because they damage infrastructure and shape the landscape. The research project has been running for five years. 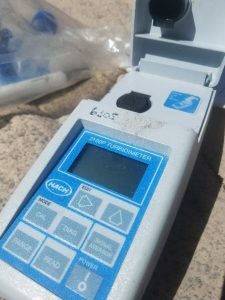 Water samples are tested for iron content, turbidity, total dissolved solids (TDS), oxidation reduction potential (ORP), electrical conductivity (EC), pH, and temperature. 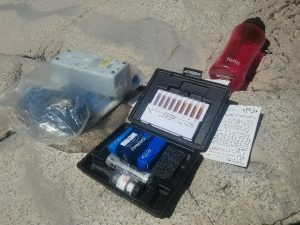 The water sampling equipment laid out. The Ultrameter measures for electrical conductivity (EC), oxidation reduction potential (ORP), pH, and total dissolved solids (TDS). 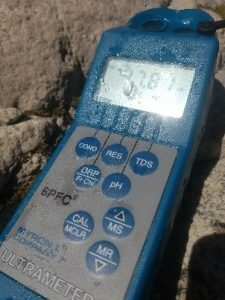 An average of three readings from the Turbidimeter provides the team the measurement for turbidity. Ian gathering water samples to test for iron content. 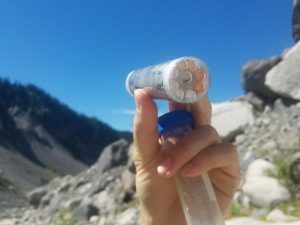 Comparison of the water sample (center tube) is used to determine iron content. The project’s goal is to have base data to compare to when the next glacial outburst flood occurs. 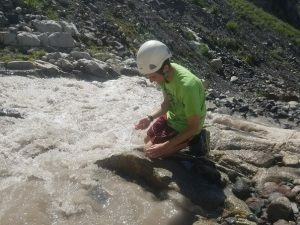 Through comparison of the chemical signature of “normal” water versus “glacial outburst flood” water, park scientists can build a model that tracks these water changes and better predict when these flood events will occur. Me with the terminus of the Nisqually Glacier in the background. Photo taken by Ian Mundy. 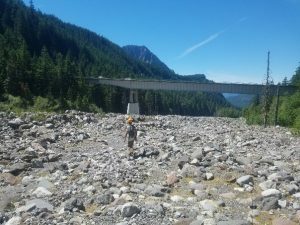 Returning from water sampling with Glacier Bridge and the Tatoosh Range in the background. Photo taken by Ian Mundy.